남해용문사괘불탱은 본존불상 좌·우에 협시보살상만을 배치시켜 삼존도 형식을 보여주고 있다. 중앙의 본존불상을 위시하여 좌측(向右)에는 정면을 향한 채 똑바로 서서 여의(如意)를 들고 있는 보살상이 자리하고 있으며, 오른쪽(向左)에는 좌협시보살상과 동일한 자세로 서서 연꽃가지를 받쳐 든 보살상이 배치되어 있다. 중앙의 본존불상은 어깨가 훤히 드러난 오른손을 길게 내려뜨리고 왼손을 가슴 앞까지 들어올린 채 두 발을 좌·우로 벌려 연화좌를 딛고 서 있는 입불상으로, 둥글넓적해진 형태에 눈·코·입이 작게 묘사되고 미소가 잘 보이지 않는 경직된 표정의 얼굴은 수평으로 들어올려 각이 진 어깨와 더불어 18세기 후반 이후 불화들에서 주로 나타나는 전형적인 양식 특징이다. 좌협시보살상은 보관을 쓰고서 여의를 들고 있는 점으로 미루어 보아 석가모니불의 좌협시인 문수보살상이라 추정된다. 머리 크기에 비하여 어깨가 좁아지고 작아진 발로 인하여 위축된 느낌이 들긴 하지만, 팔에 걸쳐 흘러내린 길고 굵은 천의자락으로 인하여 전체적으로는 안정감이 있어 보인다. 우협시보살상 또한 좌협시보살상과 표현이 유사하다. 그림 하단부에는 화기가 남아 있다. 이 괘불탱은 인물의 형태 및 표정, 신체 비례 등에 있어 18세기 중반 이후 불화의 전형 양식을 잘 보여 주고 있을 뿐만 아니라, 경직된 듯 조화롭고 세련된 표현기법을 보여주어 18세기 중반 이후 불화 연구의 자료적 가치가 크다. 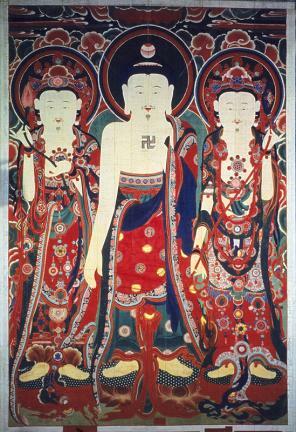 This hanging Buddhist painting was made in the style of a samjondo (a painting with a main Buddha flanked by two Buddhist figures), with the main Buddha in the middle flanked by a Bodhisattva on each side. Both Bodhisattvas are depicted in a frontal stance, with the Bodhisattva on the left holding a priest’s staff and the one on the right, a lotus flower. The main Buddha in the middle is standing on a lotus flower pedestal with his feet spread apart, his right hand hanging down and left hand raised in front of his chest. He is wearing a robe that covers only the left shoulder, leaving the right shoulder and chest bare. The main Buddha’s large, round face, small features, rigid expression and square, slightly-raised shoulders are all characteristic features of the style of Buddhist paintings that emerged after the late 18th century. The Bodhisattva on the left is presumed to be Munsubosal (Manjusari Bodhisattva), judging from the fact that he is wearing a jeweled crown and holding a priest’s staff. Although the shoulders are too narrow compared to the head and the feet are too small, the long, thick cheonui (divine garment) draped over the arms adds a sense of stability to the overall form. The Bodhisattva on the right is similar in appearance to the one on the left. A record of the painting’s history is inscribed in the bottom of the painting. This hanging painting reveals the artistic style of Buddhist paintings that were prevalent after the mid-18th century, particularly in terms of the forms of the Buddhist figures, their facial expressions and physical proportions. It is an outstanding work of art produced with elaborate and expressive techniques, and is an invaluable work for the study of Buddhist paintings produced after the mid-18th century.